All of the best/worst stories start out that way. I feel like it’s important to share some of my story though because it might help others understand this illness better or maybe someone else will see a little of themselves in it and feel less alone. So a little over a decade ago, I had randomly decided to attend law school 2500 miles away from anyone I knew, in the middle of the Rocky Mountains. Sounds great, I know. It sort of was except I was fantastically manic. Aside from the $30k I spent at basically a Walmart in town, I also had this strange feeling that I was being watched by Fed-Ex trucks. I was convinced that they were spying on me on behalf of my mother. 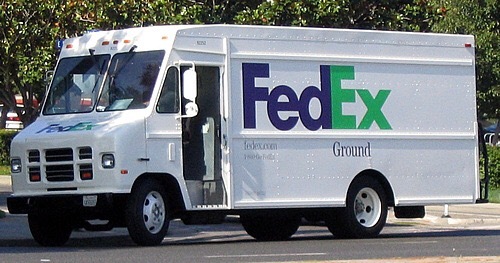 It’s important to understand that I was in a fairly remote area and even back then, everyone ordered everything online, so Fed-Ex trucks were sort of ubiquitous. Huge semi ones to the little neighborhood delivery ones, I saw all kinds every day. I believed those drivers were reporting back to my mom, and then every time I saw one of those trucks, it just confirmed my suspicion. On a base level somewhere I thought maybe I was being ridiculous, but for the entire 2 and 1/2 months I was out there, I never could shake the feeling. There is also a thing known as “delusions of reference” where a person holds even more tightly to the warped thought. I’m happy to say that I escaped relatively unscathed from the truck part of that experience at least. Now I chuckle when I see Fed-Ex go by, if I even notice them. For a long time though, it wasn’t really funny and I noticed every single one, even though I didn’t have the idea anymore. I just wanted to share this today because I think this is a part of psychosis that people don’t often talk about. I’m grateful to not be there today, but I know it can happen to me again and the more educated people there are in the world, the better. Thanks for sharing. A story shared always has a chance of touching someone somewhere.